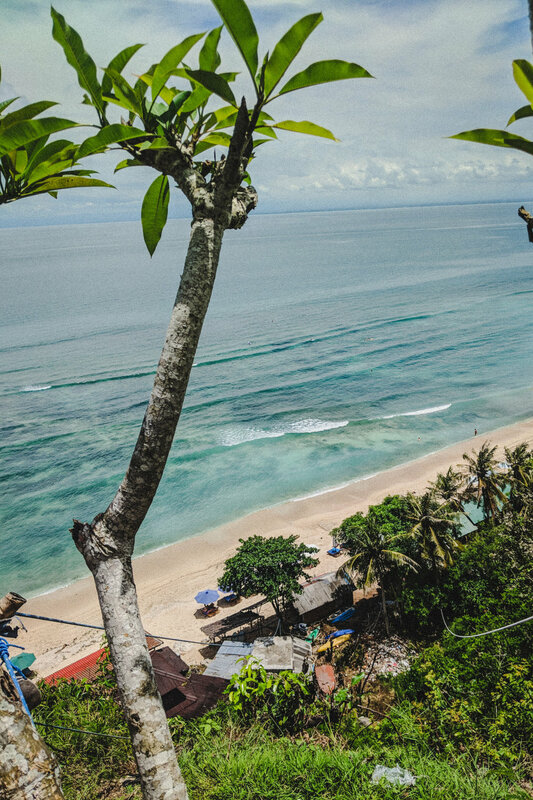 I’m going to be honest - Bali wasn’t really at the top of my list of travel destinations when I first decided that I wanted to make traveling a priority of mine a couple of years ago. I didn’t know many people that had gone at the time, I hadn’t watched Eat, Pray, Love, and I found the flights to be incredibly expensive (upwards of $1000). That being said, it wasn’t in my head that I wanted to go for a long time. 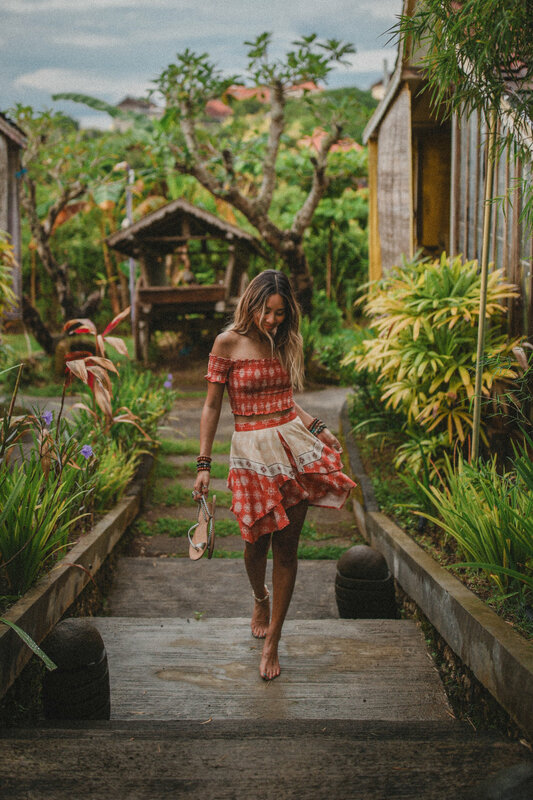 Since I love tropical destinations and sharing my travels on Instagram, YouTube & on my blog, I began to get several recommendations to visit Bali over time. Since Bali also seems to be a very popular destination that I see other bloggers and influencers sharing on social media (and the photo/video content is insanely beautiful), I began to think I was missing out on something and decided that I wanted to finally make a trip out there this year. Luckily, I was able to find flights for me, my husband and our couple friends for around $500 roundtrip (each) through China Eastern Airlines, and our trip was booked. Our flight was about ten hours to Shanghai, China (with an equally as long layover spent at an airport restaurant) and then another seven hour flight to Bali, Indonesia. We arrived around midnight with our carry-on luggage (none of us checked in a bag) and exchanged about USD$200 for Indonesian rupiah while we were still at the airport (as the exchange rate is way better there than here in the US). Alternatively, our friends pulled out rupiah at the ATM (but my husband and I didn’t want to deal with those foreign transaction fees). We exchanged another USD$200 later on the trip and put everything else (hotels & bigger restaurants on card). As for hotels/accommodation, I decided not to partner up with any resorts on this trip since I wanted to explore more of the local life vs. the resort scene. 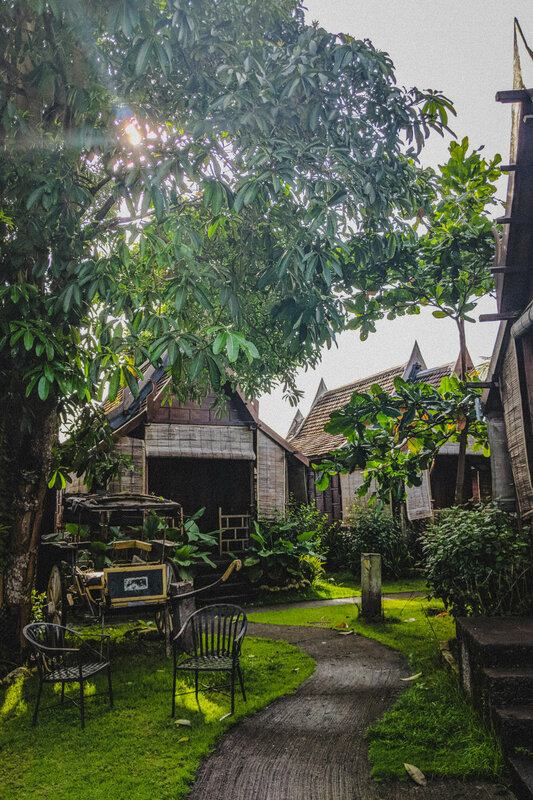 Too many times I've heard (and seen) that because our dollar is so strong over there that people end up renting out these amazing villas for super cheap, but never leaving them to experience the actual culture. In case you didn’t follow along my Okinawa, Japan trip, I use the Booking.com phone app to find hotels once I’m at my destination as I find it really helpful for finding affordable accommodations that include things like free breakfast, free airport shuttle, free WiFi, etc. all thanks to the super easy-to-use filters within the app (also not sponsored, I just love this app while traveling). 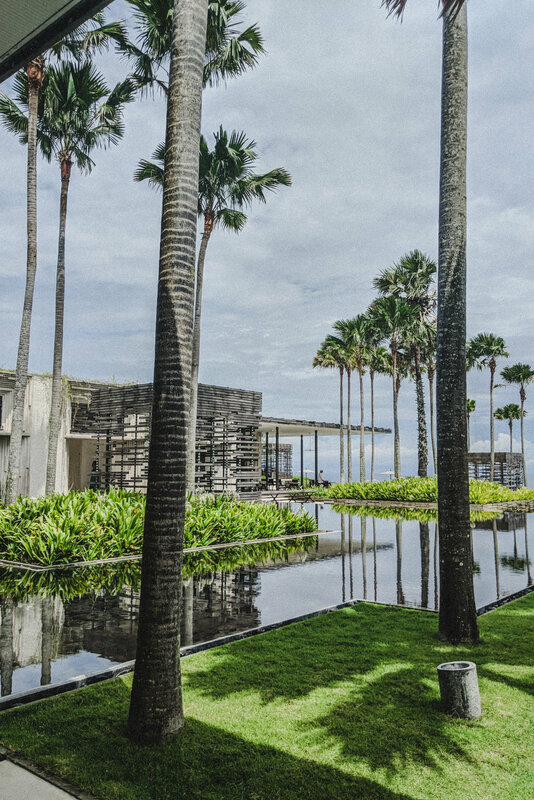 Our first hotel didn’t offer an airport shuttle due to the late hour, so we ended up taking an Uber from Ngurah Rai International Airport (DPS) to Uluwatu. Uluwatu is an area on the southwestern side of the Bukit Peninsula in Bali (supposedly) known for its surfing and its steep cliffs. Our friend Aylmer wanted to surf at least once on our trip, so we decided to start here and checked into the My Dream Bali Resort & Spa. We picked this resort because of its closeness to the airport (about 20 minutes), it had a 24 hour front desk, and free breakfast was included. Once we made it to the property around 2 o’clock in the morning, we knocked out until the sun rose. Our room was a one bedroom “villa” nestled in between the leafiest trees I’ve ever seen and we woke up to the sound of cicadas and chickens every morning - it was a pretty incredible experience. The property is also attached to the Baan Ying Thai Restaurant (which is delicious and where we had most of our meals), has its own pool (which we didn’t use), and offers spa services (though we only got massages). The staff was amazing - very friendly and willing to help us with anything we needed - and there’s also a 24 hour market and ATM next door. If you are thinking of staying here, keep in mind that it’s on the cheaper side, the bathroom is outdoors (A.K.A. bugs everywhere), it’s not a luxury villa (more like a rustic cabin), and this property feels more like a step up from camping (so it’s not the cleanest). The weather kept shifting from overcast to sunny to rainy our first two days in Uluwatu, but we were determined to try out surfing our first full day. Since my friend Eda and I were beginners, we had a taxi bring us over to Thomas Beach nearby. Our taxi driver's name was Sang and we ended up calling him whenever we needed a ride during our entire time in Uluwatu. He didn't speak much English, but was so kind and willing to drive us anywhere, anytime. The entrance to the beach was kind of hard to find and the stone steps going down are low-key horrifying, but the view from the top is unreal and the shore wasn't too littered with tourists. There are several restaurants and "shops" where you can rent surfboards, buy refreshments and negotiate other activities with the locals, but we kept it simple and grabbed a few lounge chairs, bought a couple of fresh coconuts and rented some surfboards. We spent the entire day at this beach until it rained on us, but I had the best time learning how to surf here. The waves were super mellow in case you're thinking of learning here too, but I will say that this beach is definitely not the cleanest close to the shoreline (lots of trash) and the bottom of the beach is uncomfortably rocky, so I did leave with a few gnarly scrapes. 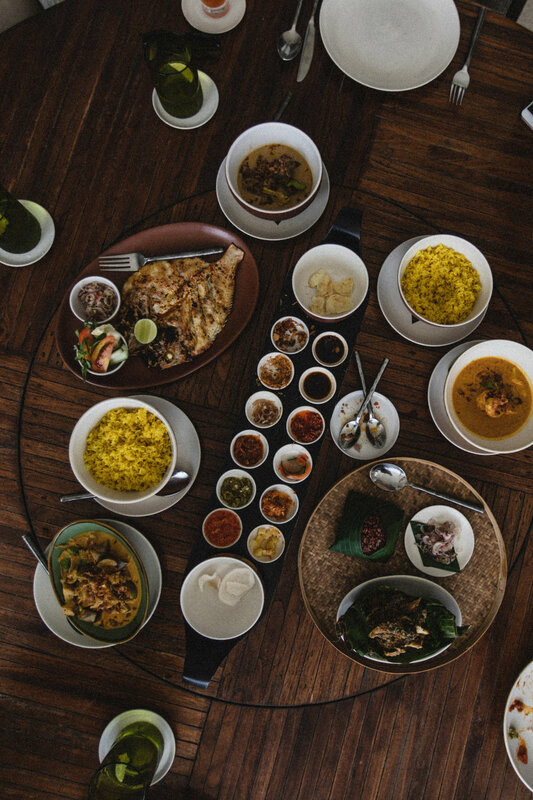 Our next day was met with rain as well, but it stopped around noon just in time for us to head out to have lunch at The Warung at Alila Villas Uluwatu. This meal was definitely the most expensive of our entire trip, but definitely worth it considering the taste, staff and ambience. Once we were finished, we explored the grounds a little and took a few photos to capture how serene this resort by the cliff was. After a little exploration, we called up Sang to drive us over to the Uluwatu Temple and he escorted us the entire way (even took a photo of the four of us). The view from here is absolutely incredible, but definitely watch out for the monkeys here as they are pretty aggressive. They'll steal anything shiny/they can get their hands on - a woman was even jumped by one not too far away from us. The sun was starting to set at this point, which is around the time of the Kecak and Fire Dance performance - RP100.000 or about USD$8.00 - and I thought it was beautiful! It was a little crowded and definitely a tourist trap, but I'm always up for seeing anything traditional of the culture I'm visiting and watching the sunset somewhere spectacular. 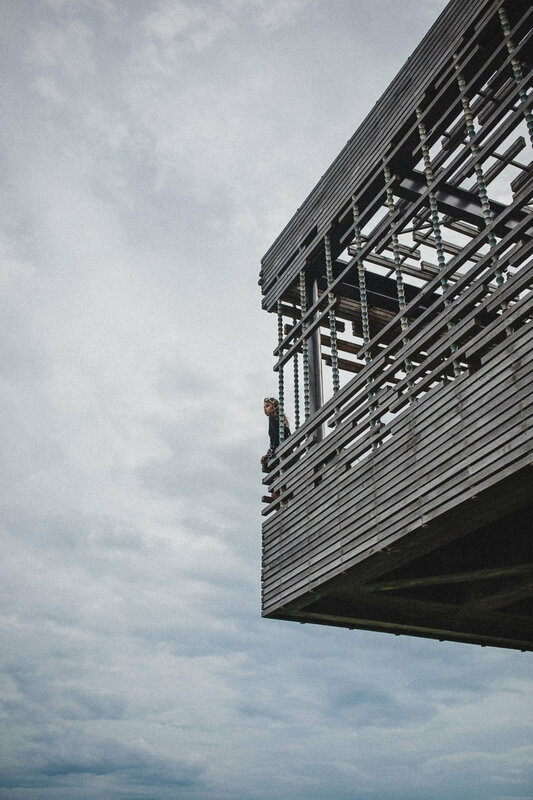 Once we woke up the next day, it was time to leave Uluwatu and head over to our next hotel in Canggu. Our trip dates ended up falling on Nyepi, which is a Balinese “Day of Silence” celebrated by Hindus at the start of their calendar year (March 17th, 2018) by following a ritual called Cater Brata Penyepian. The ritual calls for no fire (including electricity), no travel (no one is allowed outside of their homes), no activity, and no entertainment for twenty-four hours (6am-6am), so we decided to book a stay at a yoga retreat resort called Udara Bali in Canggu during that time for some yoga, rest and relaxation since we wouldn't be permitted to leave our hotel during Nyepi. I didn’t snap any photos of our room as it wasn’t that memorable, but the property itself was right on the ocean, served fresh food (and healthy vegan options), had the owner's pet bunnies hopping around (so sweet! ), and was designed with several meditation corners, coves and balconies throughout the property and pool area. After checking out the resort, our friends wanted to meet up with a family member staying in Seminyak, so we explored the neighborhood around us for awhile until it was time for dinner. We met them over at Echo Beach for dinner at a restaurant not worth mentioning (probably the only time I didn’t enjoy the food during this entire trip) and chatted until the sun went down. This was the night before Nyepi, so on our way back to the resort, we actually got stuck about a mile from our hotel by a parade in the neighborhood nearby called (I believe) the Ngrupuk Parade. Each village from the area builds an Ogoh-ogoh statue in the shape of a mythological being or demon to represent the purification or ridding of malicious spiritual pollutants within the living environment and community, showcases them in the parade, and then later burns or destroys these statues in a graveyard or cemetery. I was surprised at how elaborate - and not to mention huge - these statues were. The crowd was filled with chanting, music and torches, so we filmed as much as we could and just enjoyed. After watching the parade, we made our way back to the resort and prepared for the next day. On Nyepi, we really didn't end up doing much. Our resort offered a sunrise yoga class and I took the time to stay off my phone and just enjoy how beautiful the scenery was. I woke up so early in the morning right before Nyepi day ended at 6am that the sky was still dark, so Raleigh and I snuck out and looked at the stars. I don't have any photos or video - just my memories - but that's definitely an experience I'll never forget. Once Nyepi ended, Raleigh and I decided to rent scooters from our hotel and head to Peloton Supershop in Kuta for breakfast since an Instagram follower of mine had recommended it. I ordered an açai bowl and some kombucha (which was very good), but I definitely preferred the local Indonesian food we had been eating everyday. 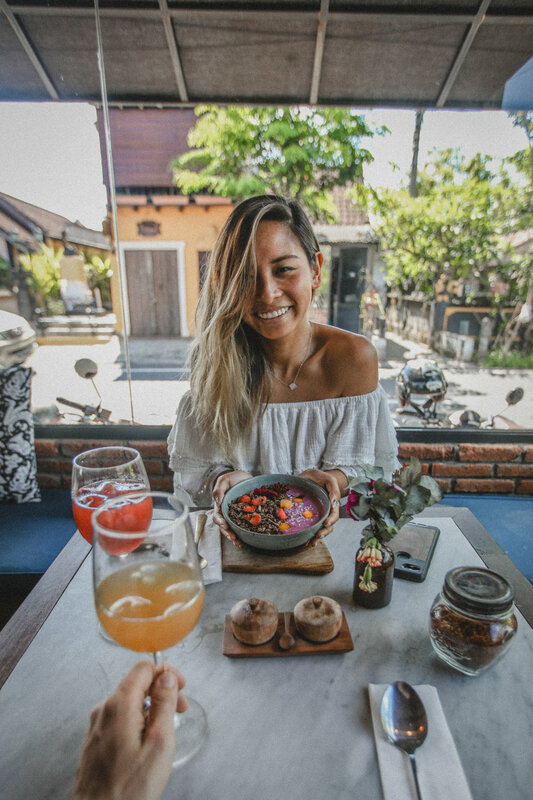 The place kind of reminded me of another place being recommended to me on Instagram: Kynd Community - a really popular cafe in Seminyak (where I literally see every single blogger take a photo of when in Bali). Not to say that either of these cafes aren't worth going to (and like I said, Peloton Supershop was very tasty), but I did feel like everything they served was something I could easily have at some trendy shop in Los Angeles. I much preferred the tropical fruit and vegetarian noodles being served to us in the less popular, local restaurants. After breakfast we wanted to explore as much as we could before we moved on to the next place. Now, literally everyone we spoke to who had visited Bali told us not to drive scooters. I kept hearing how it wasn't safe, how the police would pull us over, how we would be able to get anywhere just by taking a taxi - obviously we didn't listen. I'm fully aware of how dangerous it was (especially after seeing what driving was like), but I AM SO GLAD WE DROVE SCOOTERS. I was having a good time up to the point before the scooters, but once I got on the bike, it was like I was on an entirely different trip. All of the locals drive on scooters to get to where they need to go (even if they have huge loads to carry), and that's what I want to experience when I travel. I want to do things and see things that I don't have the privilege of seeing at home. Raleigh drove most of the time (because I almost threw him off the bike on three different occasions), but even then, I don't think you'll really get a feel for how beautiful Bali really is until you've ridden on a scooter. Just driving through the streets and seeing the locals go about their day, trying not to run over the feral dogs wandering in the street, getting rained on in the middle of a sunny day and almost driving into a rice paddy - I can't explain how phenomenal it truly was. If you're not the type to enjoy the simple things, the scooter might not be for you, but I can honestly say I loved it. The last three days of our trip we decided to leave for Ubud since we planned on doing a lot there, so I whipped out my Booking.com app (yet again) and found a villa called Be Bali Stay. The villa sits on a farm owned by a woman named Made and her entire family, and we were in love with it from the moment we arrived. Even though our villa rested on a family farm, the owner offered everything from scooter rentals to massages to cooking classes and more, so we had all the luxuries of a resort while maintaining the privacy of a residence (which I loved). Made cooked us breakfast every morning (fresh fruit and vegetarian noodles for me), and I am still having cravings to this day. The property also ran through a river which we explored and what felt like miles of forest. Our friends even saw a monkey at one point, so it definitely felt like we were waking up in the middle of the jungle every morning. 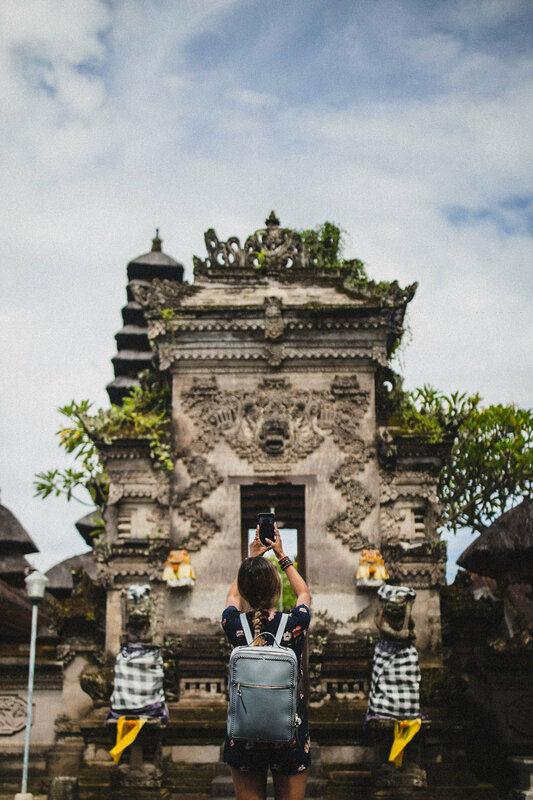 Once we explored the villa, we ended up taking the scooter to the Ubud Traditional Art Market to buy some souvenirs for our families until the sun set. After speaking with the locals though, they told us that the market had become overly-priced due to the amount of tourists visiting over the years, so Raleigh and I ended up visiting the Sukawati and Guwang Art Market during our trip as well (and I do believe the prices were much cheaper even though the types of things sold were the same). The next day, we were determined to visit the Ubud Monkey Forest, so we drove the scooters out there to see the monkeys. I took mostly video while we were here, but I did get a few shots of a monkey on my shoulder! 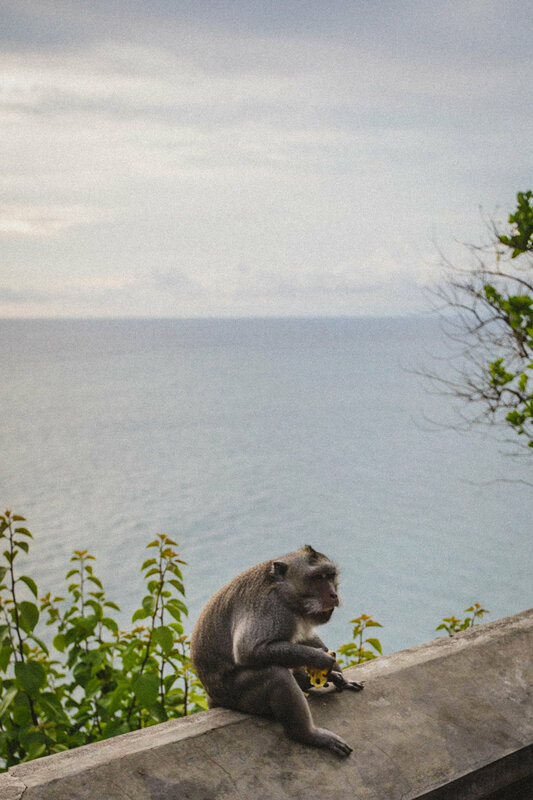 They sell bananas within the forest to entice the monkeys, but definitely be careful not to tease them with the bananas as they can be quite vicious when antagonized (especially the larger ones). A woman actually got bit by an agitated monkey while we were there, so if a monkey wants your banana - give it to them. After visiting the forest, we went a little crazy after lunch and decided to follow Raleigh to a tattoo shop nearby since he had been wanting to get one on his arm for a while. 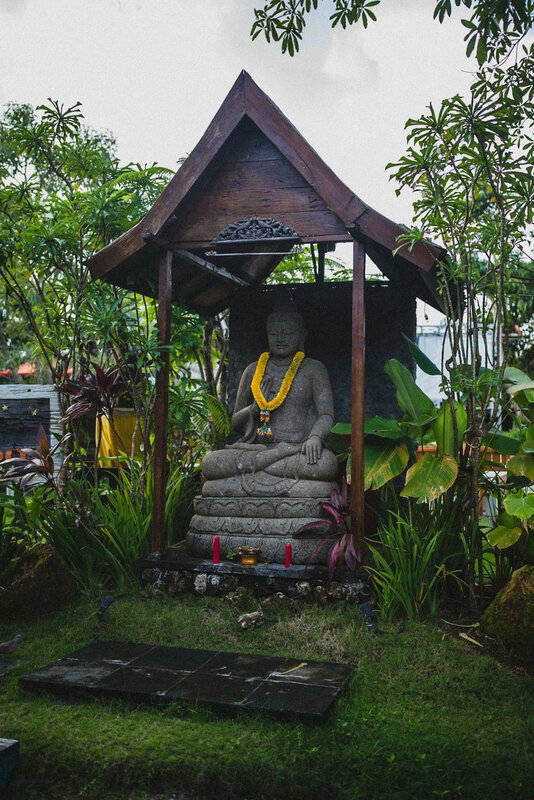 The tattoo shop he found was called Ibu Ubud Tattoo Studio and it has amazing reviews - for good reason. This shop is clean, the needles all new, and the tattoo artist (Rai) is amazing. I have a photo of Raleigh's tattoo, but everyone in our group ended up getting one (including me). Our last day in Ubud was the day we decided to take the cooking class Made was offering, so her son drove us to the Payangan Food Market nearby where he walked us through the different fruits, vegetables and other things sold there (as that's where most of the locals buy what they need). The locals even let us taste some of the things they were selling, but we only ended up leaving with some mangosteen fruit and a big bag of Bali coffee (a really fine ground coffee that we had been drinking everyday since the beginning of our trip). Strolling through this market was so fun and it was enlightening to see the costs of everything there. For example, coconut oil and palm sugar are pretty expensive when bought in the US since it's imported, but over there, they have such an abundance of it that it would be under a dollar to purchase (and the taste is much better). I only snapped a couple of photos of our cooking class with Made and filmed what I could, but it ultimately slipped my mind as her class was so enjoyable and I didn't want to miss a moment of it by trying to capture it on film. She showed us around her farm and pointed out the different crops grown which were going into our meal (while the rest was bought from the market). The food was probably the best I've ever tasted and she ended up giving us the recipes for everything we made so we could enjoy them at home as well. Following the waterfall, we continued to drive around and just got lost (on purpose). 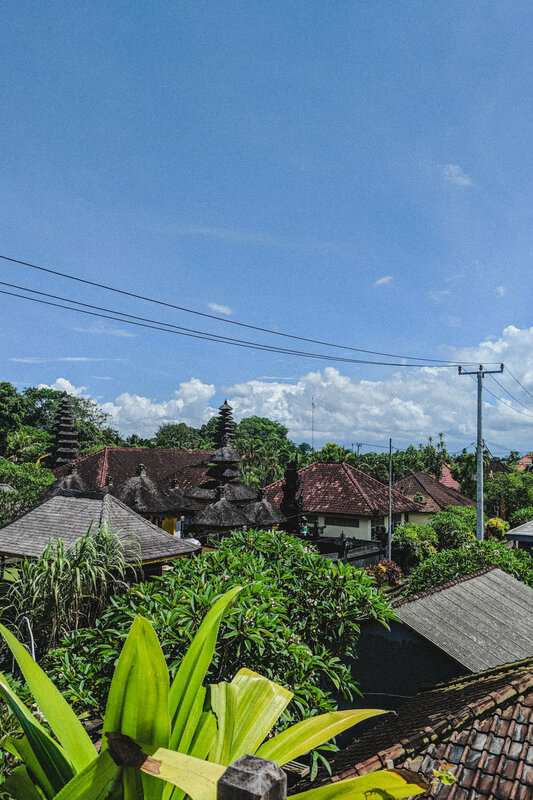 We drove through neighborhoods, markets, abandoned streets and just admired how very much alive Bali is. There is something so laid-back and for lack of a better term - "wild and free" - about the way the locals live. They live happily with what they need and don't seem to strive for more than that (at least from what I saw). 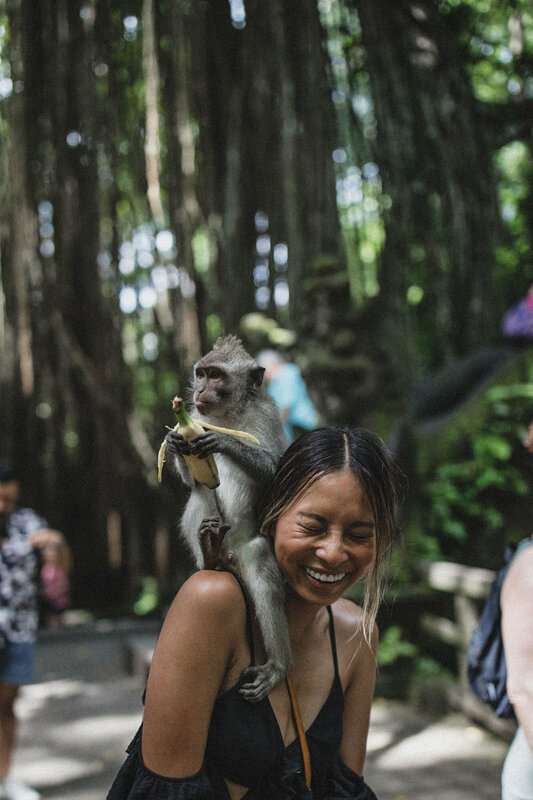 To sum up my trip, yes - Bali is totally worth the visit, but once I got there, I discovered that I loved it for reasons that I can't quite convey through photos, videos, or even this blog post. I've always loved to travel since I was a little girl, but I definitely think that social media has transformed it into something else. Something where we're constantly trying to shock one another with how incredible the view is. 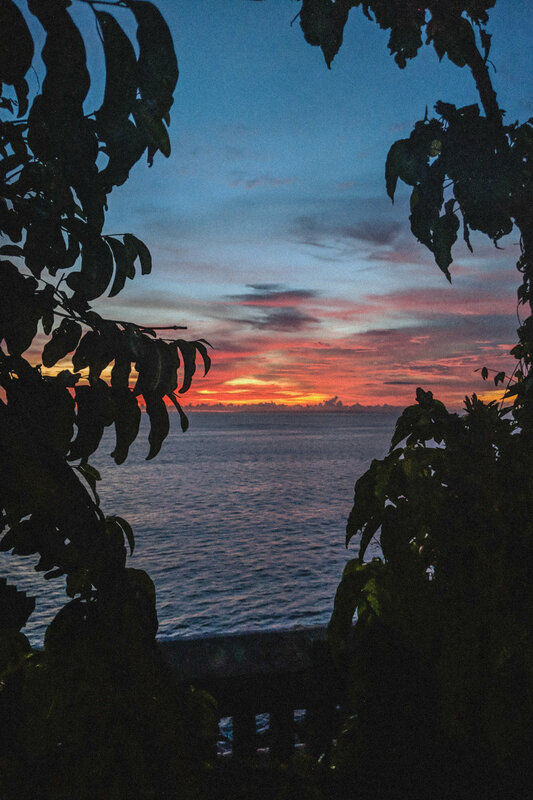 Yes, Bali has amazing views - but look beyond the areas built to wow the tourists visiting and take time to admire the everyday scenery that you can't see at home. 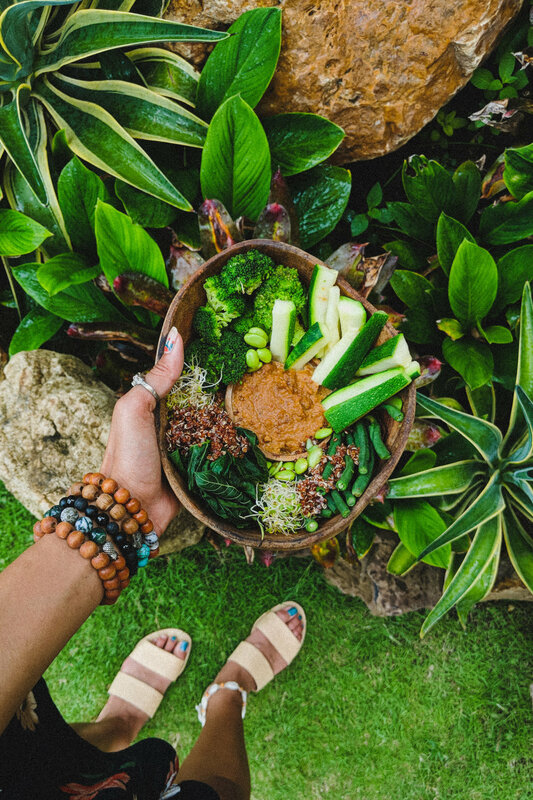 Yes, the food is great - but I would encourage anyone visiting to try the local food (especially the mie goreng noodles and mangosteen fruit) over the pretty açai bowls shared on Instagram. Yes, I want to go back - but not just because I had an incredible time, but because I feel like I barely saw enough. I definitely want to make another trip back there as I don't think I'm entirely satisfied that I explored it fully, so you'll definitely see me there again sometime in the future.